Here is a basic, general purpose resume template that can be optimized to fit most job and education profiles. Because of the wide range of modifications and choices available with our templates they can be adjusted to fit most every job. This is a valuable asset because it is a simple matter of clicking buttons to change features of the resume to match each job application. Style number six has features such as a clearly defined name and address at the top. There is sufficient space between the name-address section and the content below it. The Skills and Objectives sections have adequate space to keep the facts organized and clearly visible for a quick read. The Education and Employment sections include the business and institution names, addresses, degrees earned, job titles and dates as applicable. These facts are placed on two lines that are single-spaced. The details of each entry are single-spaced below the dates. The schools and jobs themselves are spaced apart for organizational purposes, to keep the facts separated. The facts are set to the left except for the dates and the cities-states which are set to the right. 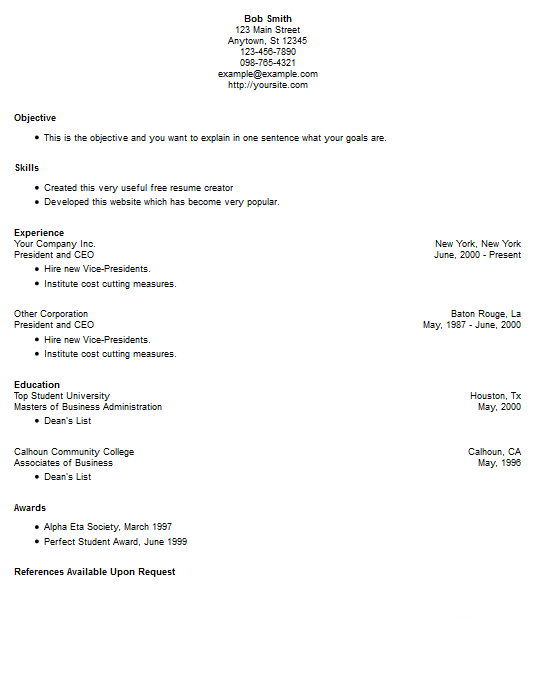 Our free resume creator program is the means used to obtain this basic style. This style can be used with all our programs not including the business cards creator because cards obviously use different formatting than a page.